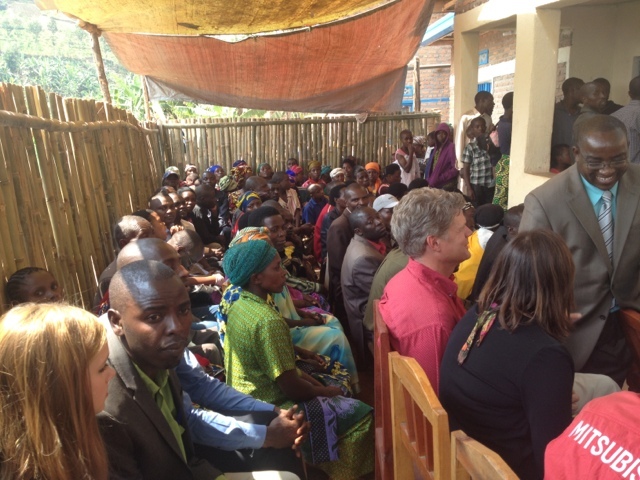 The day I left Rwanda we had a big celebration for the 30th wedding anniversary of our hosts. They basically renewed their wedding vows. Anyway, hundreds of people came, I would like to give a more specific estimate of the number of people, but it could have been 200 or 400 because of the walls and hills and buildings I could not really tell. People had traveled four hours from Kigali the capital and similar hours from Uganda, well, I suppose we traveled from the US in large part for this celebration. 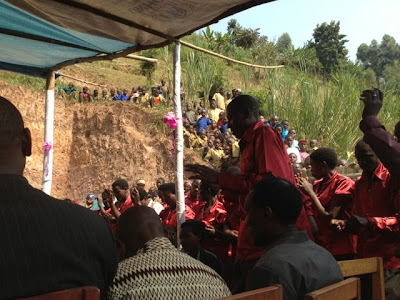 Celebrations like this are apparently very common in Rwanda. They even had a choir in shiny button up shirts sing for us! The point is that community still exists. Maybe most of the people were there for a free meal or sorghum beer, or to see use mzungos, or because this was the richest family in town and people like handouts. Regardless, it was fantastic! I did cry taking the second picture. Again these people were singing about how happy they were, yet the situation was far more tenuous than anything we experience in the US. This was the reason going with a local was the ideal way to visit a country. I would not draw crowds like this, of more than 200 people. The whole experience reinforced the fact that I am, and we all are, so blessed. Even in a desperate place to live, like rural Rwanda, there is no conflict, most people have food and most people have extended families. There are many things in the world to be grateful for, it is important to remember those things and not take our wealth, our power, our authority for granted.